Butcher Jeff Rapley from Narooma in New South Wales, Australia, says he meant no offence with a sign meant to boost bacon sales. 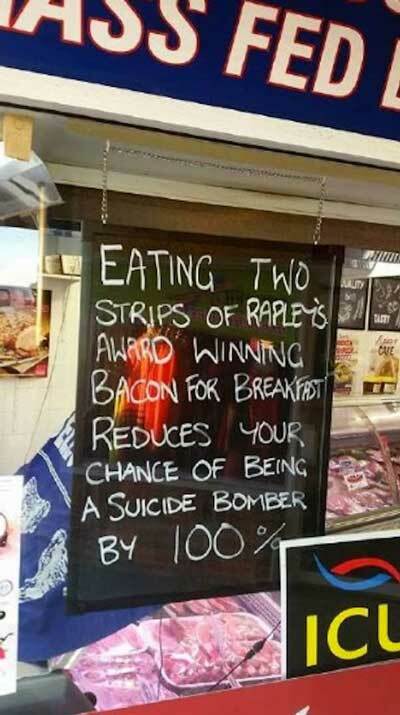 Earlier this month Mr Rapley put up a sign in his shop window stating: “Eating two strips of Rapley’s award-winning bacon for breakfast reduces your chance of being a suicide bomber by 100%”. A local resident who noticed the sign complained to the butcher and he removed it later that day and has not displayed it since. Mr Rapley said he did mean to cause any offence and no particular religion was mentioned. He also noted that he does have a Muslim assistant working for him. “I’m definitely not a racist and didn’t mean for it to cause offence,” he said. On the plus side, his bacon sales have increased and he is almost out of stock. "Mr Rapley said he did mean to cause any offence and no particular religion was mentioned." If he was taking the piss out of a religion, that isn't racism. Only if that religion inbreeds with itself and nobody else would it likely to eventually become a race.